We live in a text bound age full of litigious people concerned about copyright, intellectual property, and authorship in the modern sense. I have a friend in fact who is in fact a intellectual property lawyer. You don’t want to know all the permutations and combinations of that law. By contrast, the first century world of the NT writers was a dramatically different world. For one thing, it was largely a world of oral cultures. Perhaps 10-15% of the populus was literate, could read and write, and even less actually owned ‘texts’ or manuscripts. Furthermore, the production of texts in antiquity was a tremendously laborious process, and expensive as well. Scribes did not come cheap, papyrus and ink was not cheap, and the codex, or notebook form compilation was just coming into existence in the first century A.D. Most documents were written on a single sheet of papyrus which would be rolled up and tagged, with what I like to call a toe tag—a small identifying marker. Scribes were not mere secretaries in antiquity, they were in fact the intellectuals and scholars of their age. It you want to learn about their various roles you can read several of the chapters in my forthcoming Baylor book What’s in a Word. Not surprisingly, ancient views about ‘authorship’ are not quite the same as modern views which assume ‘individual’ authors for almost all documents that aren’t collections of essays by some group of scholars. However in ancient collectivistic cultures this was not the norm. Many, if not most ancient documents were anthological in character--- a compilation of traditions from various different persons and ages through time. This was true about collections of laws, proverbs, songs, religious rituals, and stories as well. We should not be surprised in the least in reading through the book of Proverbs that all of a sudden in a book ascribed to Solomon, we have in Prov. 30 the sayings of Agur, or in Prov. 31 the sayings of King Lemuel, whoever he may have been. Or again, the psalms are compilations from various different ages, some are probably songs of David, but some are songs for or dedicated to David, some are composed by others still. It is a mistake to evaluate ancient documents as if they were just like modern documents, and this applies to NT documents as well, in various regards. For example, the vast majority of scholars are in agreement that the Gospels we call Matthew and Luke are compilations from a variety of sources, including Mark and a sayings collection, and some unique material not found in other Gospels. Of course, this becomes puzzling to modern readers of Matthew because they rightly ask the question--- why would an eyewitness apostle like Matthew need to use secondary sources for events he was present to view? Why indeed. Here is where I say to you that while we must properly answer this question, one also needs to not do what Bart Ehrman does in his chapter on who wrote the Bible when it comes to this issue—which is to suggest that these Gospels were originally anonymous, and labels were added to them later for apologetical purposes, and that when we read of who they are attributed to in an early source like Papias, we can with a wave of the hand simply dismiss such evidence. 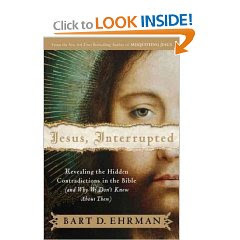 If you want to read what a historian of merit has to say indetail about the Papias’ traditions I would point you to Richard Bauckham’s book Jesus and the Eyewitnesses, which is mostly a close reading and explanation of Papias and what he says. It does not in any way agree with Ehrman’s analysis of these early traditions. Indeed, most scholars today think there was a collection of the four canonical Gospels together at some point early in the second century in codex form which is when we get the official labels—according to Matthew etc. based on earlier traditions about the sources of these documents (see e,g, the work of Graham Stanton). When the Gospel documents were originally written, the audiences that received them knew who the authors were and had a relationship with them. This is especially clear from a text like John 21 which informs us that while the final compiler of the Fourth Gospel is not the Beloved Disciple, nevertheless, he is the source of the traditions in this Gospel, having written them down, and “we know that his testimony is true”. The compiler of the Fourth Gospel knows the man personally, and can vouch for his trustworthiness in telling the Gospel stories. So let’s deal now with some of the flimsy assumptions made which are the basis of Ehrman’s conclusions. 1) Assumption One: The canonical Gospels were probably originally anonymous. This is wrong on two counts. First, when these documents were written down, if there were not identifiers in the document, the papyrus would have been tagged by the scribe to be able to distinguish it from other documents, and these tags regularly had the names of the author or compiler and sometimes a short title as well or instead. Second, we should not imagine that the Gospels were written for general public consumption. Publishing in antiquity was almost always an in house, small audience thing, unless we are talking about Emperor’s publishing laws and propaganda. The circles for which these Gospels were written in all likelihood knew who wrote these documents. Papias is simply basing on to us the early traditions about Matthew, Mark, and John that he heard personally from John the elder, who had know various of the eyewitnesses. 2) Assumption Two: In the case of a Gospel like Matthew which includes some 95% of Mark within it, obviously this means that Matthew had nothing to do with the content of this Gospel since it relies on earlier and even secondary sources. This sort of reasoning ignores the anthological nature of most ancient documents. All it took for a document like Matthew to be labeled ‘Matthew’ is if he was the most famous source used in the document for some of its material. And of course if the three sources used in that document are: 1) material from Mark, not an eyewitness, 2) material from Q or a sayings collection; 3) material from some other unique source scholars usually call special M material, then if either 2) or 3) came from Matthew, his name would take precedent over Mark’s in the document, especially if there very first source material in this Gospel, the birth narratives, came from Matthew. What Papias says is that Matthew had compiled some of the largely sayings material of Jesus in Aramaic or Hebrew. This sounds more like 2) above, than 3), but Papias is general enough that it could be 3) since the Greek word logia need not mean just ‘sayings’. It could mean teachings, for example or even ‘words about the Lord’. 3) Assumption Three: Jesus’ disciples were “lower-class, illiterate, Aramaic speaking peasants from Galilee.” (p. 106). First of all fisherman are not peasants. They often made a good living from the sea of Galilee, as can be seen from the famous and large fisherman’s house excavated in Bethsaida. Secondly, fishermen were businessmen and they had to either have a scribe or be able to read and write a bit to deal with tax collectors, toll collectors, and other business persons. Thirdly, if indeed Jesus had a Matthew/ Levi and others who were tax collectors as disciples, they were indeed literate, and again were not peasants. As the story of Zaccheus makes perfectly clear, they could indeed have considerable wealth, sometimes from bilking people out of their money. In other words, it is a caricature to suggest that all Jesus’ disciples were illiterate peasants. And Bart is absolutely wrong that Acts 4.13 says otherwise--- what Acts 4.13 says is that the council is shocked at the theological capacity of Peter and John because they are ‘unlettered’. This is not the ancient word for illiterate, it is the word for not being learned, not having done formal school training, say in a synagogue. We need to move on now and consider what Bart says about forgeries and intellectual property in antiquity, and yes indeed there was a concern about such matters in the first century A.D. though certainly not to the same degree as we find today. Bart is also right that there were also not only forgeries in antiquity, there were also pseudepigrapha of various sorts. Now the latter has to be evaluated on a genre by genre basis. By this I mean that while there was a literary convention when it came to apocalyptic works to ascribe those works to ancient luminaries or worthies (e.g. the Testament of Abraham is not by Abraham, the Parables of Enoch are not written by Enoch and so on), it was not an approved literary practice to write letters in the name of other persons without their approval or dictation. This issue has to be evaluated according to the literary type of document we are talking about. The parables of Enoch are not a forgery, they are a pseudepigraphic apocalyptic document and the conventions were well known in early Judaism about such documents. Pseudonymous letters, sermons or speeches are a whole different ballgame. These, if they are genuine letters or sermons, can be called forgeries if there is no connection between the putative author and the actual author of a given document. Bart is absolutely right when he says “Ancient sources took forgery seriously. They almost universally condemn it, often in strong terms.” (p. 115). He is also quite right that forgeries had the intent to deceive. And he is also equally right that various of these sorts of documents were penned in the second century A.D. to add to the corpus of Christian writings for various purpose. A good example of this would be the so-called Acts of Paul and Thecla, or the Epistle to the Laodiceans. Our concern is not however with such documents, but with those from the first century A.D. (and it is only first century documents in the NT) that made it into the canon of the New Testament. Are their forgeries in the NT? First of all, we need to bear in mind that anonymous documents are not pseudonymous documents. Hebrews for example, has no attribution of authorship internally or externally, it is an anonymous sermon. Perhaps Apollos wrote it, but in any case, the author of the document is not trying to pass it off as written by some luminary. Secondly, there are documents which are internally anonymous but had an external attribution. For example 1 John, in the content of the document says nothing about the author at all. It is a sermon, and it appears that early Christian sermons, like Hebrews, were frequently produced without internal attribution. And exception to this is James. Bart wants to argue that this is by some otherwise unknown James. The problem with this suggestion is shown by the many commentators on the book of James, and also by the content of the book, which draws on no less than 20 sayings of James’ brother Jesus. As Bauckham has shown at length, there is no reason to doubt James is by the famous James the brother of Jesus, any more than there is reason to doubt Jude, who identifies himself as James brother is by Jude, the brother of Jesus. On the other hand, Bart is right that Revelation is by one John of Patmos, who is probably not John Zebedee, nor is he the Beloved Disciple. This man was a apocalyptic prophet whose Greek and theologizing is different from that found in the other Johannine documents (see my Revelation commentary). The real issue when it comes to pseudeigrapha in the canon is whether documents like 2 Thessalonians, Colossians, Ephesians, the Pastoral Epistles, 2 Peter are pseudepigrapha. Bart thinks they are, and I think they are not. For the record, the commentators are about evenly divided on most of these books with the exception of 2 Peter, which most take to be a pseudepigrapha. In fact 2 Peter is a compilation document which draws on Jude in its second chapter, and on a testimony of Peter in the first chapter, and perhaps some Pauline material as well in 2 Pet. 3. As a compilation document it is attributed to its first and most famous source Peter. There is a Petrine testimony about the Transfiguration in 2 Pet. 1, that likely goes back to Peter himself. The compiler of the document does not see or present himself as an author. He follows the ancient tradition of attributing the compilation to its most famous contributor, as we saw was true for Proverbs, Psalms, Matthew as well. But what about those Pauline letters? Let me remind the readers that Paul certainly used scribes. We see this in various of the ways Paul ends documents. For example, in Gal. 6 he says he is now taking up the pen and writing a bit in his own hand, which clearly implies he has been using a scribe to compose the letter. Or in Rom. 16 we have a greeting from the scribe Tertius whom Paul used for that document. In the Pastoral Epistles Paul tells us “Luke alone is with me” which explains why the Pastorals reflect so much Lukan vocabulary and style. ‘Authorship’ in the ancient world was a term that basically meant ‘a document which comes from the mind of X and faithfully reflects his views/message, whoever actually composed the document’. If an author had a faithful scribe who knew his mind on an issue, he could simply tell the scribe—compose a document on X on wax, I will review it, then you may copy it out on a papyrus, with possible changes. There was a sliding scale between on the one end using a new or hired scribe to simply take dictation for most of the document and on the other end of the spectrum using a trusted colleague who knew one’s mind to compose a document. Paul and Peter (using Silas, see 1 Pet. 1) used such scribes to convey their thoughts for them. When one examines these NT letters carefully, and takes into account the ancient conventions about composing such letters, I see no reason to conclude any of these documents are forgeries, particularly on the basis of style, which is a function of personality and personal preference if one is a skillful writer, and it depends on the type of letter one is writing as well. Rhetorical style was chosen according to the situation. Furthermore, a skillful scribe could choose to write in verbose Asiatic Greek rather than Attic Greek if he chose (cf. e.g formal English English to American slang). When we take these things into consideration, as we should there is no reason to come to the conclusions Bart does about forgeries in the NT. The early church, as we begin to see already in Papias, was confident that their ultimate source documents went back to apostles, prophets, eyewitnesses and their co-workers, which is why these 27 documents are in the NT. They were composed by Paul (with help of scribes and co-workers), Peter (1 Peter with help of Silas probably), Mark, Luke (both co-workers of both Peter and Paul), the 4th Evangelist (drawing on Beloved Disciple written sources. The Beloved Disciple composed 1-3 John himself), the compiler of Matthew, James, Jude, perhaps Apollos in the case of Hebrews, John of Patmos, and at the very end of the NT period, the compiler of 2 Peter, drawing on Petrine and other materials. In short, the NT can be traced back to about 8 people, either eyewitness apostles, or co-workers of such eyewitnesses and apostles. Early Christianity's leaders were largely literate, and some of them, like Paul and the author of Hebrews, were first rate rhetoricians as well (see my little primer NT Rhetoric). There was a lot of insight in this post, especially on authorship. Is there a book you could recommend that describes some of these authorship issues in more detail? These posts are fantastic -- greatly helpful responses that put in words what so many of us are trying to articulate. One request: Even splitting these posts into four parts leaves them as huge reading endeavors; would it be possible to separate the portions of each post with headings, or something similar? It can feel overwhelming otherwise -- but I do want to finish them! Thanks for your always-refreshing work. Ben, I would like to see more of your works available in Libronix (Logos) where I do most of my study. Any plans for that? Depend on the book publisher such as Eerdmans in the case of NT Story? 2. If the answer to 1. is yes, then is it appropriate to have a moderate view of inspiration and the illumination of the Holy Spirit? I am an evangelical who is also an aerospace engineer with a major contractor; among the many things our company does is Cosmology research as described by the Big Bang. Part of that is we are working on the James Webb Telescope which is the replacement for the famous, yet aging Hubble Telescope. I am also a theistic evolutionist who believes that the theory of evolution could fall under the doctrine of God’s providence. God’s guiding, working through the laws of nature, originating and evolving life. I’ve read Bart’s latest and your reviews on this blog which I really appreciate. I’m sorry, I have not read any of your books yet, but I have read N.T. Wright and his New Testament and the People of God series and I’ve read Darrell Bock. I have learned about some of the various criterions for discovering the historical Jesus through John P. Meiers's A Marginal Jew series. Richard Horsley's Paul and Empire is important I think, such as what the word Gospel really meant to first century ears. The Physicist and Theologian John Polkinghorne has been influential to me as well. So these are some of the author’s who have shaped my worldview and part of the result of that to me is purposing to have a moderate/conservative response to questions 1.and 2. I realize this is an off topic conversation, but how does one approach the New Testament in light of the fact that we do not have the original texts, hapax legommena, and that sections such as John 7:53 through 8:11 are not original? In what sense is scripture inspired and in what sense is it authoritative? Do you know of anything that I can read? Jerry, I hope you won't mind if, inspired by your comment, I suggest someone else you may very much enjoy reading, given your background. A little book called God Still Matters, by the late Herbert McCabe, OP. He was a Dominican, with a background in science before he became a theologian. Jerry as a retired firefighter I certainly dont have the scientific backround as you, and am aware of good Christians who embrace evolution [Dinesh Desouza]but it seems to me that evoluion (Macro] as science is coming under intense questioning these days(1066) EVOLUTION- It’s time to do a little update. These past few weeks in Texas we have had a debate on evolution and how it should be presented in the text books. The final decision seemed to give both sides a little wiggle room. During the debate news papers would report things like ‘all scientists agree that proofs of evolution are all around us’ and basic misinformation on the whole subject. But to be fair, what do the advocates of evolution mean when they say there are proofs all around us? Basically they are speaking about known changes in the various classes of species that exist. Technically they are claiming that genetic mutations are proof of evolution. What are genetic mutations? All living things have a specified code of information built into to their systems, this code is called DNA. Over time as science has advanced in its ability to examine and test DNA, the evolutionists thought for sure that they would find NEW/ADDED genetic information in the changes that were taking place in the various species. In point of fact, if Darwinian evolution [macro] were true, you would find numerous examples of new information in these mutations. How many species have they found with this new information? Absolutely none! Again, stuff like this isn’t just a glitch in the system, it is absolute scientific/observable truth that tells us evolution, on a large scale, never happens. What does happen is various changes take place within their own set/class of being. That is God made things ‘after their own KIND’ this would mean that God did not create all the changes in the various species in the initial act of creation, but he set things in categories ‘kinds’ if you will. Now, in no way is it a violation of scripture for species to change/adapt along the way, this would be consistent with the language used in the bible. But what have we discovered? We have found that whenever a change takes place, the ‘change’ that is taking place is simply a rearrangement of already exiting information. DNA has the ability to replicate itself, sometimes in the process of duplicating, mistakes happen. Sort of like if you copied something and the copy had a glitch. Well when this happens you have a mutation, a change in the DNA. Sometimes this process actually is beneficial to the species. This is basically what they mean when they say ‘evolution is all around us’, what they are not telling you is that this actual process has proven that new information NEVER shows up. That in order for evolution to happen you NEED NEW INFORMATION, new genetic information that did not exist in the original parent. So to be honest about it ‘all the proofs’ that are around us are simply showing us that evolution, to the point of new species evolving from previous ones, actually never can happen! This singular problem in the field of genetics is considered to be the single greatest obstacle that science has run into in trying to prove the reality of evolution. When Richard Dawkins [one of the so called new atheists] was asked if he could give any examples of new information being discovered in living things, he hesitated and stuttered as he realized that the interviewer had him trapped in a corner. The atheist knows that this is only one of many scientific proofs that speak against evolution. Like I said before, the more science advances, the more proof we have against Darwin’s theory. Thanks for your reply about the status of evolution. You mentioned DNA and information (or information theory). The biggest gain in evolutionary theory over the past 9 years is the genome. More than that, the genome of current animals has all the genetic records of past of past forms, so there are genetic “fossils in the molecules”. Humans still have fish gill genes, for example. It turns out that genetic molecules are fossils too. As the genomes of more animals are compiled, the growing data is showing a correlation of the molecular history with the fossil history. A correlation of Paleontology and Molecular Biology. As time goes on, gaps in the fossil record will be filled by the genes found in living animals. A good resource for this is Hubert P. Yockey’s book, Information Theory, Evolution, and the Origin of Life 2005; Cambridge University Press. Whales and dolphins evolved from a land animal and are distantly related to the hippopotamus since they all have a common ancestor that walked on land. Moreover, whales and dolphins can’t smell at all. But from the whale and dolphin genome we now know that they have all the genes necessary for smell. It turns out that all those genes are there, but they turned off. Nasal passages evolved into the blow hole and the sense of smell dropped away, and the genes were turned off. The whale genes for smell now have no use for smelling, but they do have a use as a record of evolution. Chickens and birds evolved from dinosaurs. The domestic Chicken has genes for teeth that are turned off. But dinosaurs needed teeth. In 2005, Biologists at the University of Wisconsin attempted to trigger the formation of teeth in a normal chicken by injecting the embryo with a virus designed to ‘turn on’ the relevant gene (note no new genes were added, the tooth genes were already there). Says one of the researchers, ‘So the idea of turning on one gene that might be able to do this in an animal that hasn’t made teeth in over 70 million years was somewhat of a stretch.’ However, one could see very clearly tooth formation on the lower jaw. Implications for theology? There was probably no historical Adam. The NT understanding of Adam in Rom 5 and 1Cor 15 will need to be updated. I'd like to give a brief response to Corpus Christi Outreach Ministries above. The claim that random mutation _never_ adds to the genetic information in DNA (but rather only rearranges it) is false. A simple counterexample is when a particular gene is duplicated and followed later by one or more point mutations. The equivalent of this in a series of characters in the English language would be the string "match^" being duplicated to "match^match^" followed by a point mutation to "match^patch^" By any measure of quantity of information the final string has more. Obviously in order to produce a distinct and useful DNA string there would need to be more point mutations than the English string above. But this is quite conceivable since mutations of the duplicated gene normally do not harm the function of the organism since the original gene is still present. This leads to a faster mutation rate in such genes over successive generations than non-duplicated genes. Now I grant that this conclusion, in and of itself, does not prove that evolutionary theories are true or that they can fully explain the complexity and variety of of lifeforms. But the above information does refute the claim that random mutations cannot increase genetic information. P.S. I lean towards the theistic evolution camp myself, and as a Computer Science major I made my way through a significant amount of information theory... Still comes in handy on occasion as a Catholic priest. I'd like to give a brief response to two points made by Corpus Christi Outreach Ministries above. 1) The claim that random mutation _never_ adds to the genetic information in DNA (but rather only rearranges it) is false. 2) Though I am no fan of Richard Dawkins (I refute many of his atheistic arguments in lay formation courses I teach), I do want to debunk the claim that after being asked about mutation increasing genetic information he hesitated because he was "trapped in a corner". He paused at that moment because in that question it became clear to him the purpose of the whole interview was not what he had be led to believe. In fact, Dawkins can give a better answer to the question than I did above, and he has in his writings. For the whole story, see here or a summary here. Though Dawkins is, among other things, bad at philosophy, he isn't bad at evolutionary biology. Humans most certainly do have more genetic information than, say, a mouse or a monkey. But we also retain the same genes that passed down to us through them. We know this, for one example, because the gene that manufactures vitamin C for many mammals was switched off in the set of primates from which humans developed. That no longer functioning gene, or pseudo-gene, is still in our genome. You can't get more basic for proof than that. The problem with the argument from design is that historically it isn't even Christian. It dates back to the Greeks. Because of Paley, many Christians have unfortunately now attached their faith to a fundamentally losing argument. Read my book the Living Word of God. Thank you for your response! I suppose we all struggle with different theological issues in our walk with Christ. I am grateful. Ben, how do you deduce that the author of the Gospel of John is not the beloved disciple. I agree with Ken Boa's assessment that the beloved disciple is John himself by considering the beloved disciple as one of the inner circle and deducting those named in addition to him to arrive at John. Are you saying the disciple John was not the author? It is quite clear that the 'one whom Jesus loved' is Lazarus (see John 11.1-3). John of Patmos, who is not likely John Zebedee, put this Gospel together after the death of the Beloved Disciple, as John 21 makes perfectly clear. I have made this case at great length in 'What Have They Done with Jesus?' Note that exactly none of the Zebedee traditions we find in the Synoptics appear in the Fourth Gospel. Not even the calling of the Zebedees. Nor do we have any of the Galilean miracle stories found in the Synoptics except the feeding of the 5,000/ walking on water story. Instead we have a bunch of unique stories about what Jesus did in Judea and Samaria, which is why most recent commentaries on John insist it is by a Judean disciple They are right-- its by Lazarus. Interesting theory, certainly a possibility, but the phraseology in John 11:3 is not the same as elsewhere and it does not seem that Lazarus was a disciple in the strict sense of "follower" who would have been at the last supper. It seems unlikely that the author of the Gospel would name Lazarus a couple of times and then refer many times to the same person as the "beloved disciple". It's a puzzle indeed, not as clear for me as for you apparently. Sorry Marc there is no last supper in John as there is in the Synoptics. There is instead a meal earlier in the week (see John 12.1-3) which involves footwashing, not this is my body, this is my blood. And guess whose house the meal in John 12 is--- Lazarus' just as in John 11 as well. Notice that the Beloved Disciple reclines on the same couch with Jesus. The host always reclined with the chief guest at such meals. Who is the host? The Beloved Disciple. None of the Galilean disciples had a house in or near Jerusalem. But the Beloved Disciple did. You need to read What Have They Done with Jesus? Lazarus is very central to John's gospel anyway. The raising of Lazarus basically started the rumbling that got Jesus crucified, as John tells it in ch. 11. A bit different from the synoptics, where Lazarus never appears (except for the beggar in the parable, covered with sores). But this is the kind of thing explainable by the different perspectives of the author. A Judean author would have a different take on the politics that went into the arrest and crucifixion. I'll certainly order WHTDWJ. Been wanting to read it for a while, but the Lazarus angle has me hooked. I guess my question is this: if Lazarus was the author why would he sometimes call himself "the beloved disciple" (seemingly a pseudonym) and sometimes explicitly "Lazarus"? Marc my response is that Lazarus did not call himself 'the Beloved Disciple'. This is the term his community and family used for him as John 11.1-3 shows. John 21 makes clear Lazarus is not the final editor of the Fourth Gospel--the community says "this is the disciple who testified and wrote these things down, and we know his testimony is true." Who is the we? His community of course, who gathered his memoirs and edited them into a Gospel after he died. The Beloved Disciple himself seems to have called himself the elder or old man to judge from 2-3 John by the time he got older. Are you saying Lazarus is the beloved disciple but NOT the author of the Gospel of John? I had always taken it for granted (based on John 21) that the beloved disciple was the author. So your theory is based on the assumption that the end of John 21 was not written by the author but an addendum by someone else (the community)? Sorry if I'm missing something, I'm just trying to understand your novel position without having read a detailed explanation. Actually my position is not novel. The Beloved Disciple is always referred to in the third person in this Gospel. We would expect the first person, and nowhere is this clearer than in John 21 where 'he' is distinguished from 'we' the community. See also at the cross in John 19, where again it is in the third person. The Beloved Disciple wrote down his testimony. It was later edited into the form of a Gospel, perhaps by John of Patmos when he returned from exile. The whole point of the final story in this Gospel which denies that Jesus says "the Beloved Disciple will live until I return" is to make clear that Jesus only said "what if it is my will that...". Why the need for this clarification? Two reasons: 1) Lazarus had died again (and we can understand why his community might not expect that since Jesus had raised him once); 2) since he had died there was impetus to gather his memoirs and produce a Gospel from them. Since I haven't seen it, here is the link to BW3's full presentation of the L=BD argument. It does make a lot of sense. It's causing me to reevaluate a lot of passage in the fourth gospel, particularly the "Behold your mother" one (since Lazarus was associated with the women contingent anyway) and of course all the significance that would be added to the Resurrection event. Assessing the "State of Play"